The Year 5 Staff would like to take this belated opportunity to wish you a Happy New Year. It is going to be a busy term with exciting opportunities for the children, including an animation project, a Viking musical performance and a visit to the New Barn Field Centre. 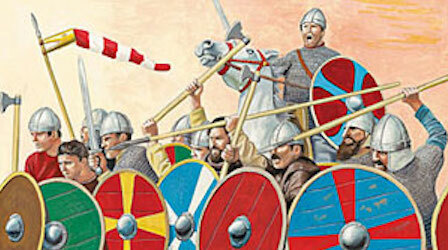 Our theme for this half term is the Saxons and after half term we will be studying the Vikings. Please click here to look at the latest topic web. As part of this topic, we will be visiting the New Barn Field Centre for a ‘living history’ day. The visit is designed to be as hands-on as possible, so that children really get a feel for what life was like. The activities vary and are weather dependent, but they include: grinding wheat to make flour, making battlefield medicines (poultices), chalk and charcoal painting, making fire and a weapons talk. More details will be sent nearer the time, but as a date for your diary, the trip will be on Wednesday 6th March for 5F and ½ 5B and Thursday 7th March for 5H and ½ 5B. In addition to this, the children will have an opportunity to show you what they have learnt about the Vikings through a drama performance. The dates for these class assemblies are as follows: Monday 1st April (am – 5H) (pm – 5B), Tuesday 2nd April (am – 5F). During week commencing 18th March, we will be running the Year 5 Maths Café. The children will be asked to make cakes or savouries for their homework and bring them into school to sell during the week. They will also work in the café and get the chance to be customers. The Maths Café is a great opportunity for children to practise maths skills in a real-life situation. Parents will be invited to visit the Maths Café on the day their child is working there. Homework across KS2 consists of spelling and times tables’ practise, which will be set on a Thursday and collected in on a Tuesday. In addition, there will be a topic-based project which will be completed across a half term. Your child has been given a log in for Mathletics, Times Tables Rock Stars and Purple Mash, which are websites designed to support their learning. Please take time to log on with your child and explore these sites. Please encourage your child to use these sites regularly and at times we will set specific activities for them to complete at home. The level and enthusiasm for reading has really started to show through. We want to continue to foster confident readers who have a love of books. Please help us by ensuring that your child is reading regularly at home for at least 20 minutes at a time and recording this in their reading record. Please ensure that you sign your child’s reading record at least once a week to confirm that they have been reading at home. We have lots of exciting rewards in school for children that are reading at home but they will only qualify for these if you sign their record. Thank you for your continued support with school uniform. A full school uniform list is available on our school website for reference. However, we would like to remind you that socks should be plain black grey or white and not trainer socks; hair accessories should be simple and in school appropriate colours; jewellery is limited to plain, round stud earrings and a watch; and nail varnish should not be worn. As the weather gets colder, you may want to send you child to school with plain tracksuit bottoms and a sweatshirt in their PE kit. Please ensure everything is named including all PE kits, coats, lunch-boxes and jumpers as this will mean it is more likely lost property will find its way back to the classroom. It is important that your child brings a named water bottle to school and we encourage them to drink throughout the day. They should also bring in a piece of fruit for a snack at playtime. There will be a parent consultation evening towards the end of this term. If you have any questions or concerns about your child in the meantime, please contact your class teacher.